Rockets have been refined over the past 150 years or so. Until the 1920s, when liquid-fuel rockets were invented, rockets were powered by solid propellants and oxidizers. Both these bring forth issues in how they’re handled on the ground or in flight. Private space flight companies are now working on hybrid rocket innovations to solve this problem. Prior to the 1900s, all rockets were solid-fueled. This means exactly as it sounds: the rocket engines were powered by propellants and oxidizers that were combined together and stored in a solid form. Back in the day, circa 13th century, the solid propellant consisted of gunpowder. 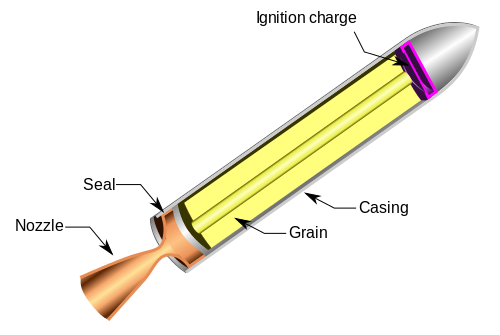 Basic concept of a solid-fuel rocket. Image courtesy of Pbroks13, Wikipedia. These days, you will still find solid-fuel rockets, but a good portion of them are now liquid-fueled instead. According to a relatively recent article from The Economist, one main issue with solid-fuel rockets is that they are difficult to control in flight. As per the article, this can be attributed to the fact that upon ignition, the fuel burns until it’s exhausted, and there is no way to control the rate of burning. Invented in 1926 by Robert Goddard, liquid-fuel rockets are, of course, also powered by propellants and oxidizers — but in this case the two are stored separately as opposed to mixed together. The propellant and oxidizer are then pumped into the combustion chamber of the engine where they are combined. Inside the chamber, the fuel and oxidizer burn, creating a high-pressure and high-velocity stream of hot gases. 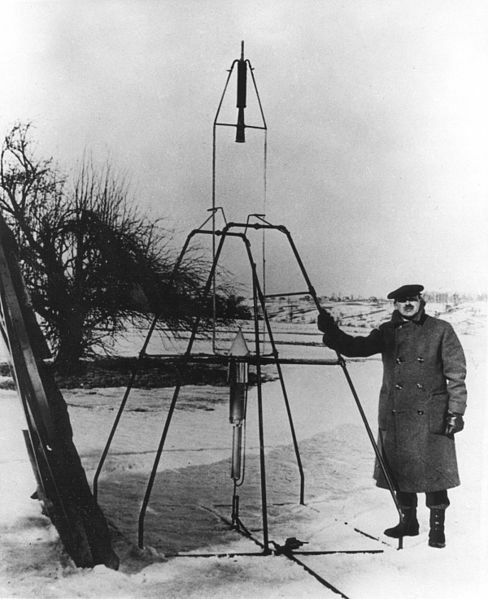 Robert Goddard and his liquid-fueled rocket. The first rocket engine of its kind was powered by gasoline and liquid oxygen, but there are lots of various fuel options to consider. You may have heard about Elon Musk’s company, SpaceX, which developed the first private liquid-fueled rocket to orbit Earth. Instead of using gasoline as Goddard did, SpaceX went with rocket-grade kerosene for their Falcon 9 rocket. Just as the Economist article highlights an issue with solid-fuel rockets, it mentions a problem with liquid-fuel rockets as well. Namely, they are hard to handle on the ground. What if we took the best of both worlds? Since solid-fueled rockets are difficult to handle in flight, but easy on the ground, and liquid-fueled rockets present the complete opposite set of issues, couldn’t we create something that is easy to handle on the ground and in flight? Cue: hybrid rockets. Basic concept of a hybrid rocket. A company called Scaled Composites is currently working on a project they refer to as “SpaceShipTwo“. This particular rocket-plane will supposedly be powered by a hybrid rocket engine (still under development), using a solid propellant and a liquid oxidant. Instead of burning the fuel until it’s gone, the hybrid rocket’s power can be regulated by changing the flow of the oxidant. SpaceShipTwo will be brought up by a twin-hulled airplane called White Knight to a 15 kilometer-altitude, whereon it will be released, its hybrid rocket ignited, and launched into space. Next step: Book your journey into space.